The air outside is crisp, your cat cries every minute he isn't on your lap, little animals are fattening up to survive the winter, and you don't need to be seen on a beach for the next nine months or so. Sounds to me like the perfect moment for a fondue party. Bread dipped in goey, piping hot cheese, strawberries ensconced in chocolate, all washed down with a mug of hot, mulled cider. It's like Christmas in October. 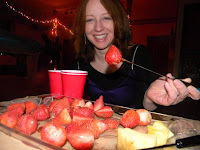 Click here for a lively playlist, and click here for my favorite fondue recipes. There are a few useful things I've learned in the many happy years since I bought my first fondue pot. 1) Buy a second fondue pot. For a small group you can get by with one, but it is a serious buzz kill if you have wait until one pot is finished, and then scrape hardened cheese off the bottom before starting a batch of chocolate. 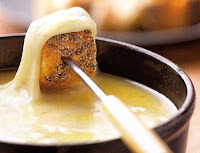 If you have a large group, it's great to have several little fondue stations. And if you have someone with dietary allergies, it's great to keep one pot free of contaminants. 2) Don't buy sterno. For some reason, most fondue pots come with a sterno holder, which at best will give you atomic levels of heat, and at worst turn your dreams of liquid cheese into scorched night terrors. Melt your fondue gently on the stove, then move it to your trivet. A small votive underneath will be enough to keep it warm. 3) Do use a double boiler for chocolate. Burnt chocolate is just nasty. 4) Make at least one thing that is not fondue. Personally, I could singlehandedly take out an entire cheese platter with no regrets. But not everyone has the intestinal fortitude to be a lactovore. Make sure you have at least one side so the lactose incompetent can get a full meal as well. And you may want to offer something as a palette cleanser - like some crudite.